Bishop White related that when he was a boy, about 1760, 'Dutch Jacob,' a “sportsman and cattle dealer” would give the pear to folks but not say where he obtained it. He bought the land near the Delaware River, and it was sold to ‘Mr. Seckel’ who publicized the pear. a town south of Phila, and in 1777 his son bought a lot in the next town, Passyunk (the "Neck"). To seven and a half pounds fruit, take three and a half pounds sugar, one and a half pints of vinegar, one ounce of cloves, and one ounce of cinnamon. If the pears are hard, boil till nearly done in water, and then put into the boiling syrup to cook till done; but if they are Seckel, or any ripe pear, boil in the syrup till a silver fork penetrates them easily; take them out and boil the syrup half an hour, or less if it gets too thick; pour over the pears while hot. Seal up when cold. Stephen Girard (1750 France-1831) was the wealthiest man in America when he died, leaving his fortune to charities and the city of Philadelphia. His country home “Gentilhommiere” with over 500 acres south of the city in Passyunk contained the old Sickel Pear tree. Col. Timothy Matlack (1736-1829) from Philadelphia knew Jurg "David Seckell." 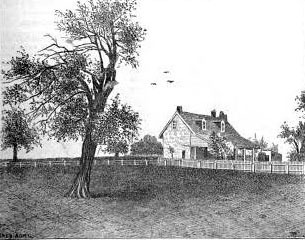 Matlack went at least once to his slaughterhouse in 1777 with diarist Jacob Hiltzheimer. He is now known for writing the finished formal copy of the Declaration of Independence, in the Nt. Archives. Memorial History of Boston. 1881.